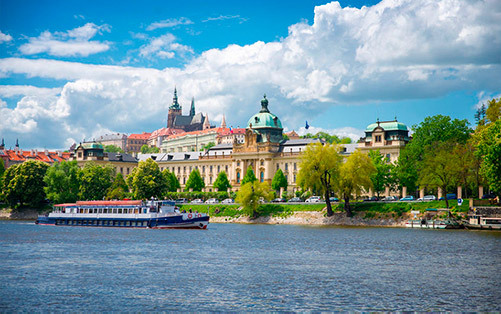 Travel by private taxi, van, minibus or bus from Passau to Prague. Passau in the southeast of Germany is located at the Austrian border. Situated at the confluence of the rivers Danube, Inn and Ilz, Passau is worldwide known as "The Three Rivers City". In the heart of Passau on the Old Town’s highest point rises St. Stephen’s Cathedral, in which the world’s largest cathedral organ sounds. Sitting high above the rivers, the majestic fortress Veste Oberhaus on the Danube’s side and the Pilgrimage Church "Mariahilf" on the Inn’s side frame the city outstandingly beauty. Many river cruises down the Danube start at Passau and there is a cycling path all the way down to Vienna.